How awesome do you think receiving an exclusive recipe in your msg box is. …cool right! When bloggers conduct events they ask for readers feedback to reach out to them more effectively. Some years back Anusha Praveen from Tomato blues had an event and she had asked what posts readers want more there. 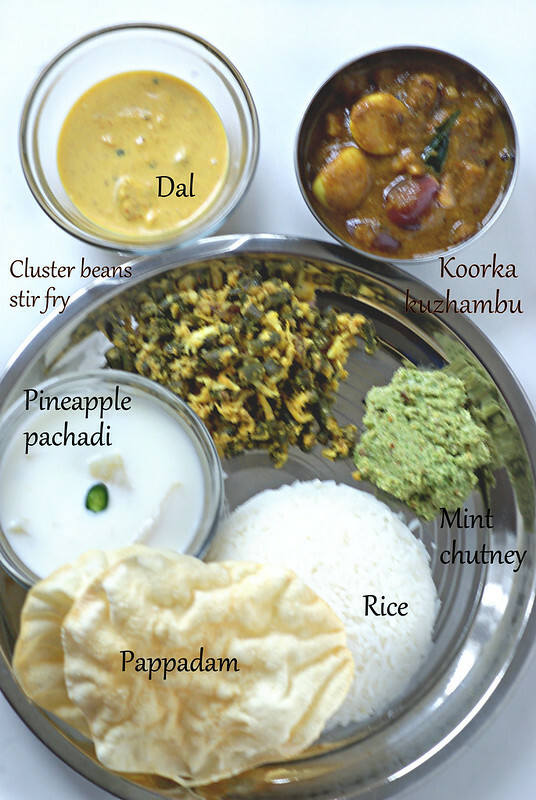 I often scramble when I have to make curries for rice so I put my request for more of it.Well, that happened long back… fast forward… recently she had put a pic of of her lunch. I requested her to give the recipe of this yummy looking curry and she responded immediately with a message inspite of having a little kiddo to take care of. Now how sweet is that ! 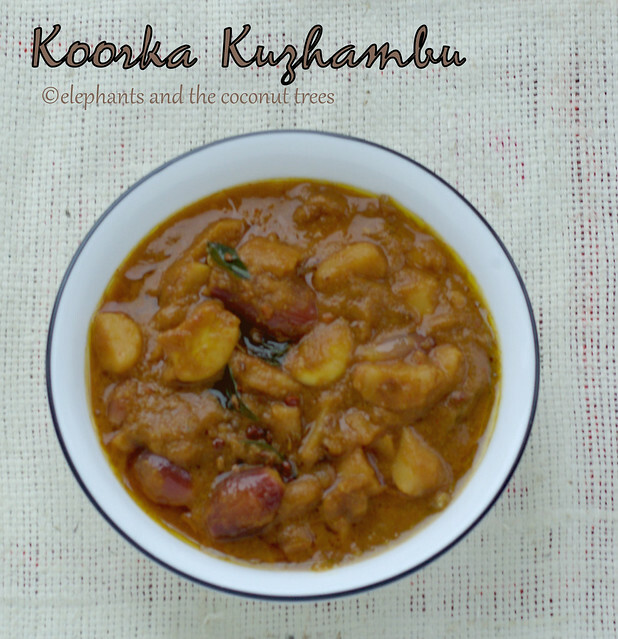 to get a personal recipe and that too with koorka which happens to be our favorite.You do not often come across curries with these tiny potatoes ,we always make stir fries how about u? Oh if you have never tried these roots they are to die for! Hmm… cleaning is a bit tedious process but u don’t need a lot here just a few will do to make this kuzhambu if u can get frozen it works fine. 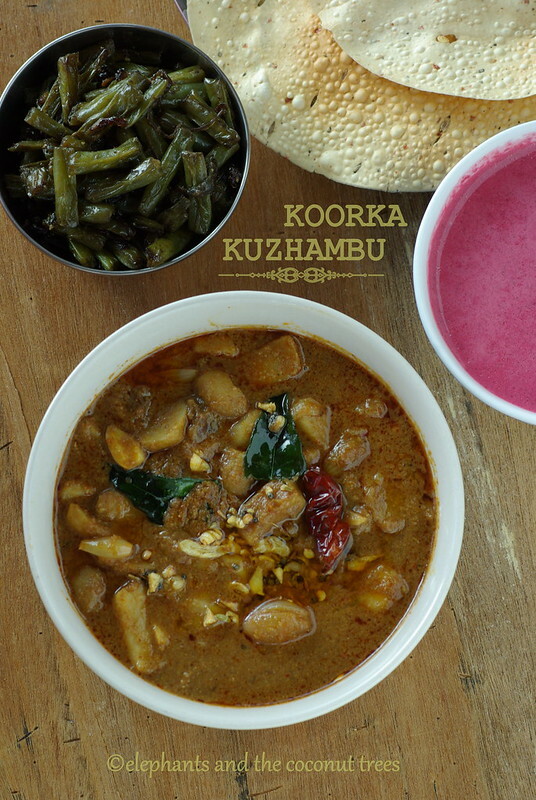 Spicy koorka kuzhambu is served with beetroot pachadi , long beans stir fry , pappadam along with rice. 1.Wash, soak koorka for half an hour peel skin and wash again thoroughly then cook it to 3/4 th (pressure cook recommended). I have used cooked frozen koorka. 2.Heat sesame oil then add the shallots and garlic and saute until golden brown. Add koorka and saute until slightly crisp and brown. Add tamarind water and simmer till raw smell goes off add coriander powder ,sambar powder mix well bring it to rolling boil reduce and add the ground coconut simmer again for 10 minutes.Remove from flame. 3.Heat sesame oil and add mustard seeds when it crackles add urad dal and fenugreek seeds when both turns brown add asafoetida and curry leaves switch off flame pour on top of the curry keep it closed until served. 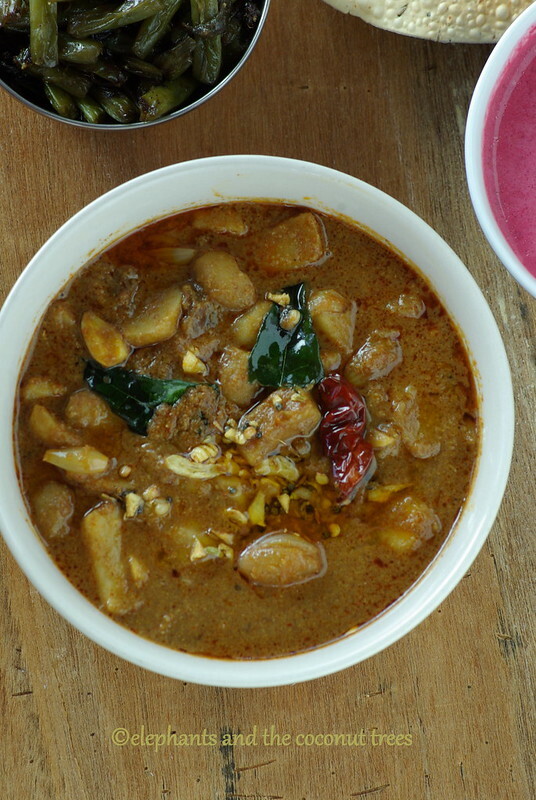 Note : The original recipe uses 1 tbsp – jaggery,rice flour – 1.5 tsp to be added tobe added towards the end and boil for 30 seconds to thicken and fennel seeds while doing the tadka. I have omitted that part and gone for ground coconut as a replacement here. This is the best pic I could take just before mealtime. Koorka is one of my favorite and I love koorka mwzhukkupuratti.. I haven't tried anything else with it so this kuzhambu sounds very interesting. It looks really good and the pics are so inviting. So sweet of u to come over Anusha. Thanks again for the recipe. The pink one is beetroot and yogurt pachadi 🙂 I make it runny as we need something to pour on top of rice like our rasam. Since koorka is already tamarind based the other is yogurt. Really! look for it in Indian store dear. Its a yummy root ur kido will love it. I too had never heard of kuzhambu till I tried this. Do give it a try Sona u will like it since u make a lot of dishes fromTamil cuisine. Aiyo!!! I am so hungry. Never heard of the potatoes but indeed worked so well in the curry.